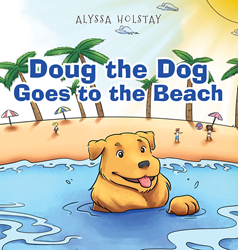 Recent release “Doug the Dog Goes to the Beach” from Page Publishing author Alyssa Holstay is a charming tale about a small-town country dog’s first trip to the beach. Alyssa Holstay, an attorney for a not-for-profit that provides legal training assistance related to matters of child welfare and child advocacy, who received her BA in political science at Shippensburg University and went on to graduate with her juris doctorate and certificate in law and government at Widener University Commonwealth Law School-Harrisburg, has completed her new book “Doug the Dog Goes to the Beach”: a heartwarming story exploring the wonders of the seashore with Doug and his best pal JJ. Published by New York City-based Page Publishing, Alyssa Holstay’s pleasing tale lets the readers see, feel, and experience the joys and amusement of going to the beach with peers, along with teaching the lesson on friendship, appreciation, and thoughtfulness to children. Readers who wish to experience this delightful work can purchase“Doug the Dog Goes to the Beach” at bookstores everywhere, or online at the Apple iTunes store, Amazon, Google Play, or Barnes and Noble.